A perfect country wedding in the middle of August last year as Team Essex meet Team Deerhurst for what proved to be an incredible day and one Team NKP won’t forget in a hurry – a fantastic group of people; lovely families, an idyllic setting and a gorgeous bride and groom – what more could you ask for! We arrived at Lisa’s Parent’s house in the pretty village of Deerhurst in Gloucestershire. Once devastated by flooding this picturesque country village is now protected by flood barriers to ensure it’s safe for generations to come. Having taken photographs of Lisa’s beautiful Maggie Sottero dress from Wedding Days of Cheltenham and accessories we walked down the lane to the Church of St Mary’s, Deerhurst where we met up with Charles who was taking the ceremony that day. Terry and his groomsmen arrived shortly afterwards where we had time to take some photographs before guests started to arrive on a blue vintage double decker bus! Quite a sight rolling through the countryside! We walked back up the lane to Lisa’s childhood home where her Father was waiting for her. The photographs as she came out of the front door into the arms of her Father for me are priceless. An incredible memory of a girl and her Daddy on her wedding day, huge emotion has been captured in the photographs and I’m so pleased we were there to capture this for them. Precious moments. Mr Gardner’s nurses had created a ceremonial arch of walking frames for him to walk through with his daughter! The whole bridal party walked down the lane to St Mary’s with villagers and well wishers looking on. Before a few moments outside the Church before the ceremony started and Lisa walked down the aisle to her husband to be. Following the ceremony Lisa and Terry left the church and walked with their guests to the gardens of the Priory next door for a champagne reception where we took a number of the group photographs as guests sipped on champagne in the afternoon sunshine. Lisa and Terry and their incredibly cute daughter Hattie then walked from the church and down the road further through an arch of confetti to Odda’s Chapel which was on the way to the field where the marquee was set up in country vintage style and miles of bunting, waiting for them to arrive. Our 5 minutes in Odda’s Chapel whilst guests continued to the marquee proved magical as with the help of a fabulous piece of kit called a Lowel Light (and Kim holding it steady) we were able to take the most magical photographs without the need for flash inside the darkness of Odda’s Chapel. We’ve had so many compliments on this series of photographs that they’ve now become quite iconic for Team NKP! 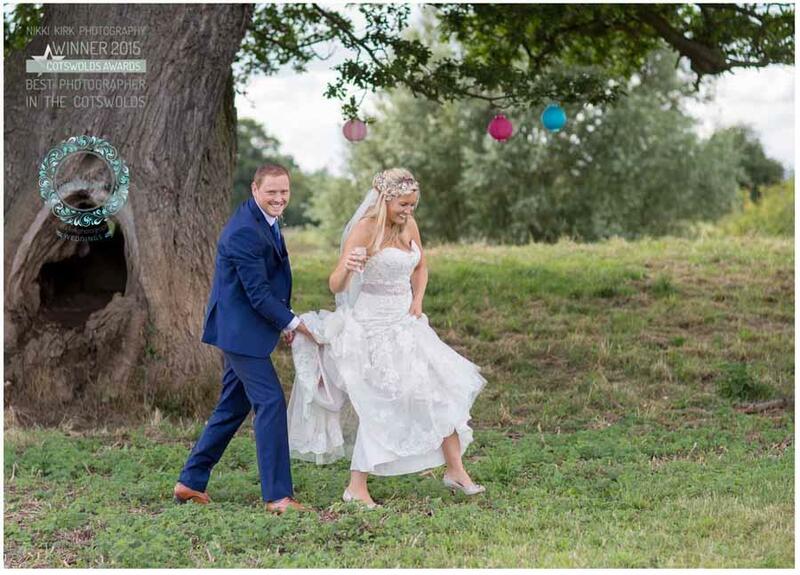 We then followed the remaining guests to the marquee field and snuck off for some further photographs in the shade of the huge tree where Terry had proposed to Lisa before making our way to the marquee and guests. A vintage afternoon tea had been laid out for guests who took their seats before cheering the new Mr and Mrs Wright into the marquee for afternoon tea and cake and speeches. Many congratulations Lisa and Terry!